La Donna Imobile is a real estate consultancy firm established in 2005 with Romanian and French shareholders. Ever since start-up, our target was to provide top-quality services and products on the real estate market of the city of Cluj-Napoca and of Cluj, Romania county. Starting up mostly as a regular real estate agency, La Donna Imobile now focuses especially on developing increasingly large-scale, self-funded real estate projects. The experience of our French shareholders, developers of real estate projects on competitive markets from European Union, is one of the key assets of our company, largely contributing to the success of the projects developed by us in the new European Cluj, Romania. 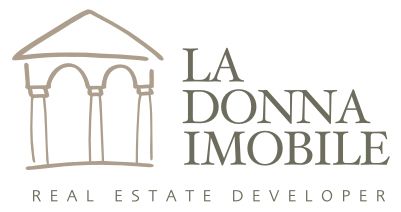 At the same time, due to a sound management and coordination of our team, based on strict principles regarding professional competence and qualification, as well as to a market-centred approach, La Donna Imobile is a reliable partner and its clients firmly believe in its capacity to solve real estate issues of any kind. Besides residential projects, as world famous companies started establishing subsidiaries in our county, La Donna Imobile also began developing projects for industrial or logistic parks. On a real estate market undergoing tremendous urbanistic and infrastructural development, you may turn to us in all confidence, as La Donna Imobile is a realistic analyst of the investment dynamics, while also being informationally connected to the urban development projects of the local authorities.